If you do fit into one of these categories but have a significantly comfortable income I would ask that you do not take the place of someone who is unable to afford the full price. This a trust-based program and I do not request proof of any type. 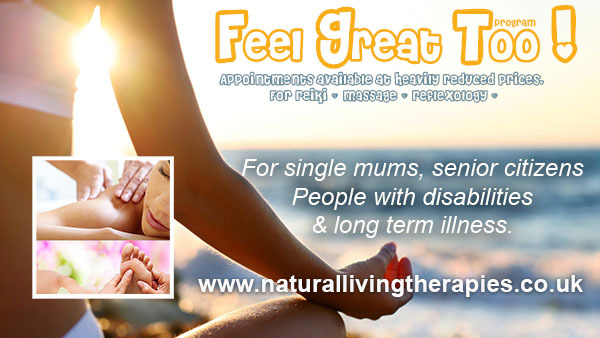 If you would like to book a Feel Good too Treatment Please call or text the number below and ask about the program. Covering Leicestershire & Rutland including: Oakham, Uppingham, Melton Mowbray, Stamford, Asfordby, Twyford, Somerby, Whissendine, Wymondham, Barnsdale, Pickwell, Great Dalby, Frisby on the Wreake, Tilton on the Hill, Langham, Burton Lazers, Cold Overton, Barkby, Beeby, Thurmaston, Ashby Folville and other surrounding areas.